AtWork allows you to make planning your work life easier while also making it possible to control your environment through connected objects that are linked through La Poste's Digital Hub. Designed for companies that want to improve quality of work life for their employees, AtWork offers four services: Easy AtWork, Smart AtWork, On Demand, and Well AtWork. 55% of French workers appreciate open office plans, but they remain frustrated by how difficult it can be to work in a noisy environment that is tiring over time. With AtWork, La Poste is simplifying employees’ work lives. This project was made possible by partnerships between the Digital Hub's platform for creating high value-added services (detailed reporting, notifications, remote service activation, etc.) and start ups selected by the French IoT programme, such as ACAo, which makes a cube for recording environmental data (Green Me), Sensing Labs, which makes consumption and presence sensors, and Air Serenity and Aykow, which make air purifiers. The Axible cube also makes it possible to activate up to six different remote services on demand (resupply, room reservations, etc.). AtWork is a highly modular solution that can meet different clients’ needs: you can decide which connected objects you want to control on demand and change the number of controlled objects based on changes in the company, whether you own or rent your office space! It is based on the relationships between the Digital Hub and start ups selected as part of the French IoT programme, relationships that have been bearing fruit for more than a year. New solutions are gradually added to the service pack as new start ups join the French IoT programme and based on clients’ needs. 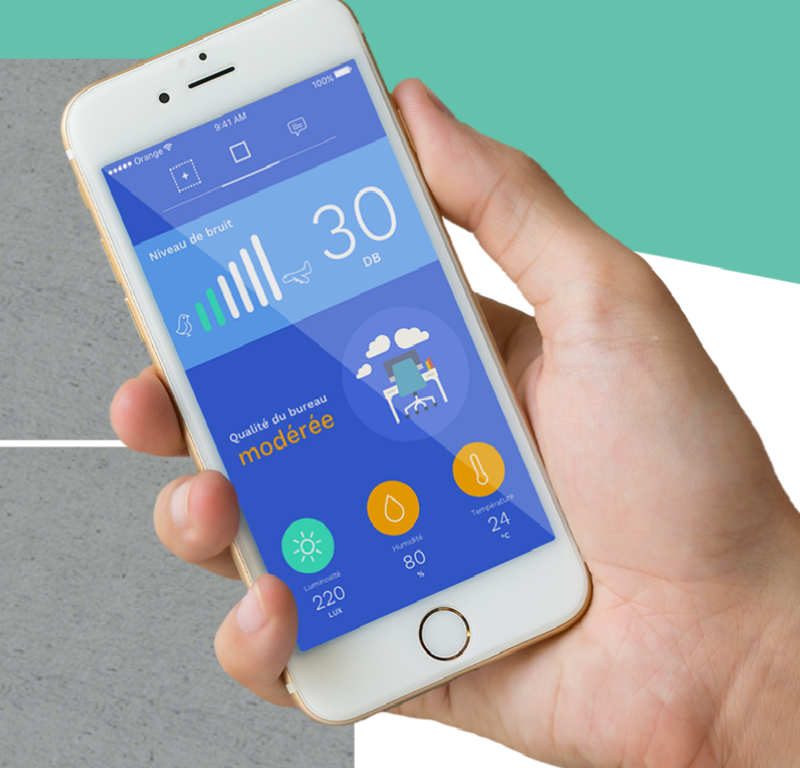 Well AtWork, for well-being at work uses sensors in the workplace to monitor noise levels, ambient temperature, and air quality, allowing users to set personalised alerts and notifications based on their employees’ needs. The collected data is sent to the general services or human resources departments to help improve well-being at work for everyone. On Demand, for controlling services in the workspace, offers an extra level of service with its connected buttons that are installed in different places around the work environment. These buttons allow employees to submit requests for technical services, cleaning services, supplies, etc. They send notifications to the relevant personnel, who can use the location feature to identify the impacted area (copy room, restrooms, common area, etc.). Quality of work life is improved when requests are handled quickly. Smart AtWork, for monitoring energy consumption in the company's building, allows users to manage and predict building energy costs (water, gas, and electricity) and to share information with company employees about what they can do in different workspaces (break room, meeting room, etc.) to save energy. Easy AtWork, for mapping buildings and reserving spaces, allows users to make employee movements easier by mapping out building interiors and indicating all of the services the company offers (room reservation, concierge services, etc.). Available in France starting January 2018. AtWork can also be used by client companies with international offices. Only the Well AtWork and On Demand services were presented at CES 2019. More information is available on the AtWork website. A local service for urban blocks combining human presence with digital permanence to simplify everyone’s lives, every day. This innovation was presented at La Poste's stand at CES 2019. The app providing faster links between patients, pharmacies and healthcare providers by simplifying medication delivery. Innovations enabling local authorities to optimise road management and meet the new topographic requirements. A product range to be presented at CES 2019, at the La Poste stand.